This is really a tale of human instincts and image processing, but to set it up let us consider two stories where the scientist and the amateur enthusiast have collided. On 1 February, 1989 the NBC television series “Unsolved Mysteries” presented a story on photographs of the Cydonian region on Mars from the Viking 1 spacecraft (you can see the story here). It spoke of what some were claiming to be evidence of an ancient civilization on the surface of the red planet, with what appeared to be pyramids, and, most spectacularly, what was described as a “sphynx-like formation”: The Face on Mars! In the early 1980s, two computer engineer contractors (Vincent DiPietro and Greg Molenaar) raised the alarm and performed an image processing technique on it. They found what they claimed to be what looks like an eyeball within the “eye” cavity. Another computer scientist (whose name I cannot track down) even claimed to discover teeth within the “mouth” portion using a different processing technique. Later, in the mid-1980s, an image analyst called Mark Carlotto performed an stretching technique on the image and found what were claimed to be eyes, a mouth and hair! The plot thickened in 1992 when the next NASA mission to Mars, Mars Observer, was launched with its camera that was vastly superior to that on Viking 1. Its designer, Michael Malin, was designated Principal Investigator of the instrument, and so his team was to decide the areas of Mars at which the camera will be pointed. It took an act of Congress to persuade Malin to add the face to his list of targets. When Mars Observer was lost three days before its scheduled orbital insertion in August 1993, a conspiracy theory was immediately born: Did NASA destroy the probe or cover up its discovery of life on Mars? There were protests outside NASA and JPL. A few years later, in 1996, NASA launched the Mars Global Surveyor with Malin, once again, as PI of its camera. Malin had announced in 1995 that the face will be on the list of targets. The raw image was acquired on 5 April 1998 and released to the public the following day, but it had not yet been through the standard image preparation software (presumably to avoid accusations of tampering) and was low-contrast and distorted. The day after that, NASA released the undistorted version. This is what is now referred to as the “catbox image” and it did not satisfy the conspiracy theorists, who continued their accusations of a cover up. You see, if you take the left half of the image, apply an imaging sharpening processing step, and then place a mirrored copy alongside the original you can get something that looks just like a face! Or is it a lion? Never mind, we can add labels to clarify it. We now have images in more detail from Global Surveyor when it took fresh images of the region in 2001 and from Mars Express, which imaged the region in 2006. The Mars Express scientists were even able to produce a 3-D image of the “face” using a stereo camera called HRSC. It is probably time to close the book on the Face on Mars. This is story with which I was personally involved. 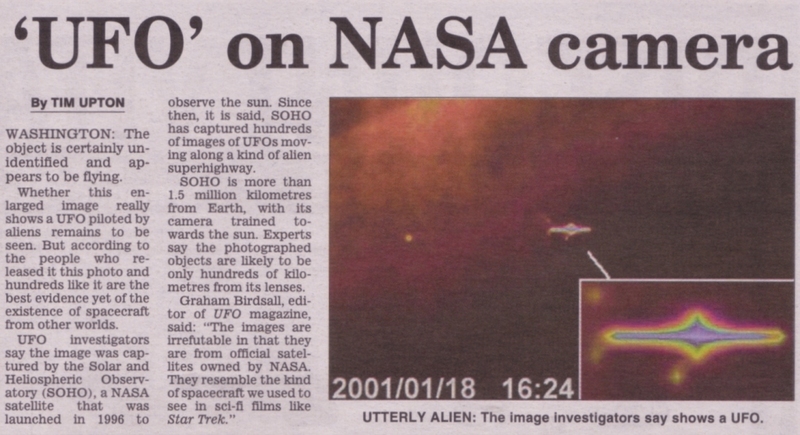 In the 15 January 2003 edition of the British version of the Daily Mail was a report that the SOHO spacecraft was beaming back “hundreds of images of UFOs travelling along a kind of super-highway”. They were provided with one such image by the owner of an electronics company in Manchester, who stated that the images were provided to him by a Spanish businessman using a large dish in his back yard to directly collect SOHO data. The objects observed were claimed to be flying saucers seen edge-on that were only a few hundred miles from SOHO itself, and that they were navigated a erratic course, indicating a form of intelligence. Other newspapers reported the claims, including the Perth Sunday Times and The Evening News of Scotland and they were due for presentation at the National Space Centre in Leicester. There were a couple of things that were suspicious about this. Firstly, the claimants did not release the original images, but only the digitally enhanced ones. Secondly, it seemed strange that the “UFOs” were always seen edge-on. It turned out that with an appropriate application of a variety of digital processing filters, well-known artifacts from the SOHO data could be made to look like the UFOs. NASA responded later that month with a “How to Make Your Own UFO” page, which can be found here. Here is what was going on. The instruments in question on SOHO are LASCO and EIT, which carry sensitive cameras to image the solar corona. If an object entered the camera’s field of view that was too bright for the camera to cope with, they would saturate. Saturation manifests itself in many different ways, depending on the instrument optics and CCD design. We often see artifacts around bright stars in astrophotography such as this one of Sirius (on the left) by Akira Fuji. LASCO and EIT saturation is manifest as an extension of brightness across pixels in the horizontal directions as shown in the right image caused by Venus in the top-right. Planets and cosmic ray hits can cause such saturations, and the example that NASA worked through was one of a cosmic ray hit striking EIT. NASA showed how these saturated objects can be isolated and heavily processed using any number of graphics-editing software packages, to produce the “UFO” images. While I would not encourage you to seek them out, there are many websites that describe features in the images of Mars as being evidence of an alien civilization on the planet. Why Do We See Familiar Patterns? The human brain is set up to identify and isolate particular patterns. This is a bi-product of evolution and probably traces back to when we were primates living the plains of Africa. Should we be separated from our tribe, it would have been beneficial to us to be able to spot things that look like ourselves among the wilderness. It would have also assisted us in spotting predators who may have been lying in ambush. We cannot turn off the part of our brain that is hard-wired to look for these patterns and as a result, we often see familiar features in places that suggest the presence of something familiar where none exists. Cloud formations are popular. How about the countless times that Jesus or the Virgin Mary have appeared on a piece of toast. The data processing that ensued in the previous two cases are cases of the cart leading the horse, where a variety of processing techniques are attempted until one makes the image look more like what the brain says that it should look like. Those images that yielded no recognizable pattern are then discarded and never spoken of. This is an informal logical fallacy called the Texas sharpshooter fallacy, which is one we did not list in our blog on logical fallacies. I applaud the excitement with which the public approaches science and I will dedicate my next blog to those important scientific advances have been with a great deal of assistance by enthusiastic amateurs. But let’s leave the application of the scientific method to the professionals, OK?